James made his debut on 5th December 1885 in the home game against Wortley which Hunslet won by one goal and three minors to one try and four minors. He played one other game this season. Season 1886-87.....This season James played for Leeds Parish Church. It is known that he scored five tries and also kicked some goals in a game against Sheffield on October 16th, but no more information is available. 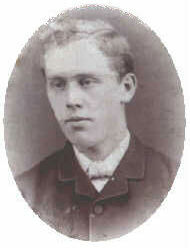 Season 1887-88.....Played six games, with one more a possibility, scoring two tries and two goals. Season 1888-89.....Played 21 games and scored three tries, four drops, two conversions, one penalty and one from a mark. Season 1889-90.....Played 35, with a possible one more, and scored 15 tries, two conversions, one drop and one mark. He also scored a drop goal for Yorkshire Probables v Possibiles. Season 1890-91.....Played 31, with a possible two more, and scored 15 tries, two conversions, five drops, four penalties and one mark. Season 1891-92.....Played 37, with a possible two more, and scored 18 tries and one conversion. Season 1892-93.....Played 34, with a possible three more, and scored at least 3 tries, one conversion and three drops. Season 1893-94.....Played 21, with a possible two more, and scored eight tries. Season 1897-98.....played 4 games for Hunslet in the professional era, although 2 of them were friendlies. James also played in a Yorkshire trial not included above.